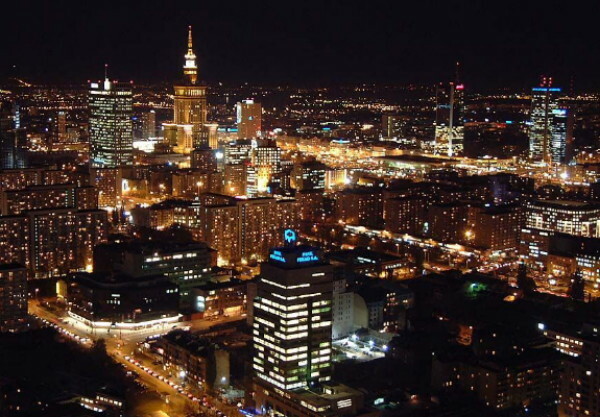 Warsaw (Polish: Warszawa). The capital and largest city (2011 pop 1,708,491) of Poland, located in the center of the country on the Vistula River. As the capital of the Polish-Lithuanian Commonwealth Warsaw long attracted Ukrainian nobles (the Sviatopolk-Chetvertynsky family, Ostrozky family, Urusky family, and other families had palaces there until 1944), Cossacks, and merchants (who had warehouses on the Vistula). The members of those strata were particularly numerous in Warsaw, but clergymen and burghers (representatives of the brotherhoods) were also present in the city during sessions of the Diet. Since 1721 there has been a Basilian monastery in Warsaw; it once owned the Łazienki park. After Warsaw became part of the Russian Empire in the early 19th century, many Ukrainian activists spent time there. At the beginning of the 20th century, when Ukrainian cultural and political life was undergoing intense development, links with Ukraine became stronger. In that period many Ukrainians studied at Warsaw University, because of government restrictions on enrollment in institutions of higher education in Ukraine. A Ukrainian student hromada was formed, with 120 to 150 members. In 1910 Ukrainian students formed an illegal revolutionary organization, the Union of Ukrainian Youth of Poland. The increasing activization of the Ukrainian movement contributed to the awakening of national consciousness among the numerous imperial civil servants of Ukrainian origin, both in Warsaw and in other Polish cities. In Warsaw there was also a fairly large colony of Ukrainians from the nearby Kholm region and Podlachia. In the 1920s and 1930s Warsaw became one of the centers of the Ukrainian political emigration, particularly for émigrés associated with the Ukrainian National Republic (UNR). In the fall of 1919 a UNR diplomatic mission was in Warsaw, where it signed in the name of the Directory of the Ukrainian National Republic the Treaty of Warsaw with Poland. The former president of the UNR, Mykhailo Hrushevsky, stayed in Warsaw briefly (fall 1919), and the UNR's supreme otaman, Symon Petliura, lived there from 1920 to 1923. Petliura's deputy Andrii Livytsky settled permanently in Warsaw, as did some other members of the Government-in-exile of the Ukrainian National Republic and UNR civilian and military activists. After the conclusion of the Peace Treaty of Riga a diplomatic mission from the Ukrainian Soviet Socialist Republic, headed by Oleksander Shumsky, was also in Warsaw. Warsaw was the center of the Ukrainian Central Committee in Poland, which was a vital organization for Ukrainian emigrants. Other groups active in Warsaw included the Ukrainian Military History Society, the Union of Ukrainian Emigrant Women in Poland, the Union of Ukrainian Emigrant Engineers and Technicians in Poland, the Ukrainian Juridical Society, the Society of Ukrainian Veterans, the Society of Friends of the League of Nations, the Society to Aid Students of Higher Schools, and the Women's Hromada (est 1924). In time the Ukrainian colony in Warsaw grew to 2,000 or 3,000 owing largely to the arrival of workers and students from Galicia and the so-called northwestern lands. Warsaw was the temporary home of Ukrainian Sejm deputies and senators to as well as Ukrainian journalists. The Ukrainian Student Hromada was revived, and the fraternity Zaporizhia was established; a social center, the Ukrainian Club, came into existence in 1928. The Promethean League of Nations Enslaved by Moscow (see Promethean movement) was centered in Warsaw and had a Ukrainian section. Church life centered around the Orthodox cathedral in the Praga section of Warsaw and around the Greek Catholic church and Basilian monastery on Miodowa Street. From 1929 scholarly life centered around the Ukrainian Scientific Institute in Warsaw, with its valuable library and publications. Warsaw University had a department of Orthodox theology and chairs of Ukrainian language and history of Ukraine. Also important for Ukrainian studies were the Polish Oriental Institute and the Institute for Nationalities Research. In 1932 the Ukrainian Economic Bureau was established, which published statistical yearbooks. Valuable archival and museum materials for Ukrainian studies were preserved in the Orthodox Metropolitan Archive-Museum, in the Zamoyski family and Krasiński family libraries, and in the Archiwum Akt Dawnych; many Ukrainian-related archival materials perished, however, in 1944. The Ukrainian scholars who lived in Warsaw included Petro Andriievsky, Stepan Balei, Vasyl Bidnov, Levko Chykalenko, Dmytro Doroshenko, Myron Korduba, Oleksander Lototsky, Ivan Ohiienko, Ivan Shovheniv, Roman Smal-Stotsky, and Pavlo Zaitsev; the writers included Nataliia Livytska-Kholodna, Yurii Lypa, Yevhen Malaniuk, Olena Teliha, and members of the group Tank; and the painters, Petro Andrusiv, Nil Khasevych, Petro P. Kholodny, Petro Mehyk, graduates of and lecturers at the Academy of Arts, and members of the artists' group Spokii. Between 1918 and 1939 over 40 Ukrainian periodicals appeared in Warsaw. In 1921–2 Warsaw had a daily Ukrainian newspaper, Ukrains’ka trybuna (Warsaw), edited by Oleksander Salikovsky; and in 1926–7 it had the newspaper Ukrains’ka nyva. Prior to 1939 Ukrainian journals published in Warsaw included Za nezalezhnist’, Za derzhavnist’, the monthlies Nasha kul’tura (Warsaw) and Ridna mova, the literary-artistic bimonthly My, and Biuletyń Polsko-Ukraiński. Volodymyr Ostrovsky's publishing firm and the publishing houses Variah and Nasha Kultura were located there. In Warsaw appeared Studiï do ukrains’koï hramatyky i filolohiï (edited by Smal-Stotsky and later also Ohiienko), the publications of the Ukrainian Scientific Institute in Warsaw, numerous Orthodox publications (from the metropolitan printing press), the series Biblioteka ukraïns’koho derzhavnyka (The Library of the Ukrainian State-Builder), and the publications of Spokii. During the Second World War the Ukrainian Relief Committee, a branch of the Ukrainian Central Committee in Cracow, was active in Warsaw, with numerous sections and organizations. The Ukrainian colony in Warsaw grew rapidly when Ukrainians fled there to escape Soviet rule. After the war and the establishment of a communist government in Poland Ukrainian activity in Warsaw declined notably, both because of the numerical decrease of Warsaw's Ukrainian population and because of the restrictions put on associations and the press, especially Ukrainian ones, by the communist regime. The situation of Ukrainians was particularly bleak in the first decade after the war, when Poland was combating the Ukrainian Insurgent Army on its territory and Joseph Stalin was still alive. In 1956 Ukrainians in Poland were allowed to have an organization, albeit under the control of the Ministry of Internal Affairs—the Ukrainian Social and Cultural Society (as of 1990 the Association of Ukrainians in Poland [OUP]), with headquarters in Warsaw. Warsaw also revived as a center of publishing for Ukrainians in Poland. The weekly newspaper Nashe slovo began to appear in 1956, as did its supplements, the cultural review Nasha kul’tura (since 1958) and the children's periodical Svitanok. The USKT and later OUP calendar (kalendar) as well as the Orthodox church calendar (kalendar) (in the Ukrainian language until 1977, since then multilingual) has been published in Warsaw; since 1988 a Ukrainian Catholic church calendar (kalendar) has also appeared. Since 1953 there has been a department of Ukrainian philology at Warsaw University. Warsaw has developed as a center of Ukrainian studies. Scholars, mainly Polish, who have been active in the field since the Second World War include the historians A. Chojnowski, Yevhen Misylo (a Ukrainian), Antin Serednytsky (a Ukrainian), Elżbieta Wiśniewska, V. Nazaruk (a Ukrainian), T. Holynska-Baranowa (a Ukrainian), M. Papierzyńska-Turek, Andrzej Poppe, Janusz Radziejowski, Ryszard Torzecki, and Zbigniew Wójcik; the literary historians M. Jakóbiec, Stepan Kozak (a Ukrainian), and Florian Nieuważny; and the linguists Przemysław Zwoliński and Zdzisław Stieber. 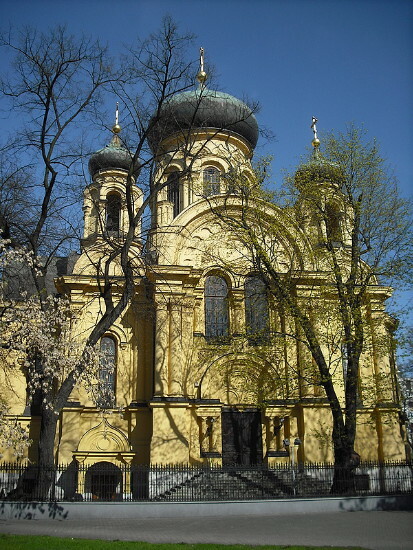 As in the interwar period the Orthodox cathedral remained a center of Ukrainian religious life. 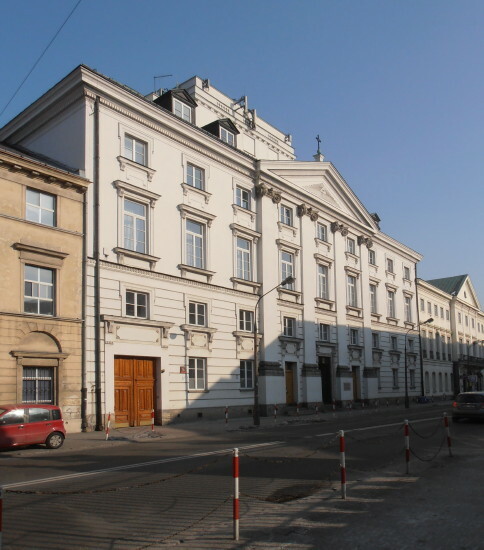 In spite of intense persecution in the late 1940s, Ukrainian Catholicism in Warsaw survived into the postwar period; both a Ukrainian Catholic community and the Basilian monastery continued to exist, although the monastery converted to the Latin rite in order to do so. With the end of communist rule in Poland in 1989, Ukrainians in Warsaw undertook new initiatives. In 1989 the Basilian fathers published the first issue of a scholarly journal devoted to Ukrainian studies, Varshavs’ki ukraïnoznavchi zapysky. A referral to this page is found in 192 entries.